Hush, if you're gonna come in here and think this is pointless. 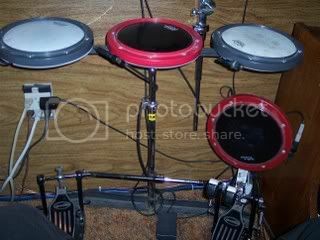 This is merely for the drummer looking to improve overall speed and whatnot, or the up and coming metal drummer looking to kick his blasts and double bass into high gear. Last edited by Howepirate on Fri Feb 15, 2008 8:52 pm, edited 2 times in total. Some ideas for you death metal drummers out there. Also, showing a bit of creativity in the metal genre. Those pedals look pretty cool! I got one recommendation: stick control by george lawrence stone. practice with your feet. or practice the rhythms with your hands over a steady 16th feel with your feet. or break up between hands and feet as you see fit. priceless. I'm holding you to it. You've been promising for a while now. I already know you're better than me so no matter what, it'll be a learning experience.